An exciting night out of mixed dances: contemporary, neo-classical, jazz, hip hop, flamenco, and many more. 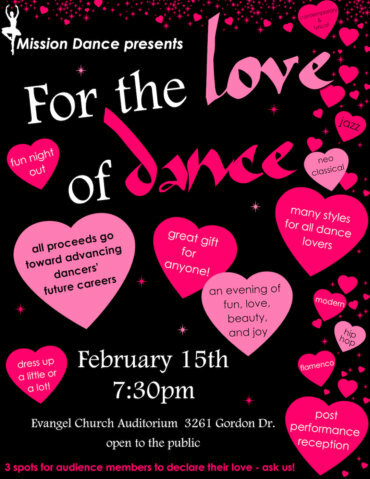 Come dress up a little or a lot and share in the whole evening with your sweetheart—featuring live music by Anna Jacyszyn and a silent auction. There are three spots open for someone to proclaim their true love to that special someone publicly during the event. 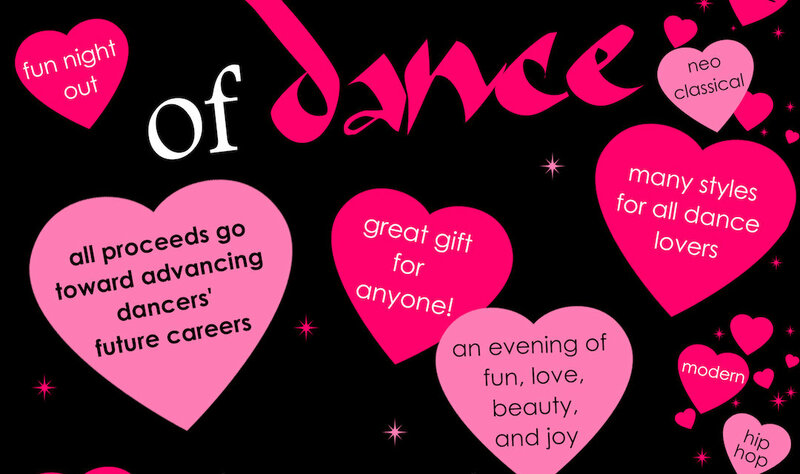 Mission Dance Centre, now in its 16th year, was founded by Tanya Vadurova-Bakala, a two-time dance award winner, Artistic Director of Mission Dance Centre and the producer/director of the event. The dancers, who will be featured in this program of a wonderful mix of dance styles, will be those who are pursuing dance as a professional career and touring to Toronto in February 2019 to train with some of the most outstanding and leading Canadian professional dance artists. These 13 selected MDC senior students will be travelling to Toronto this year, to watch either in-studio demonstrations or live stage performances of acclaimed professional dance companies such as Ballet Jorgen and The National Ballet of Canada. The rest of the cast members performing in this unique evening event are enrolled in the contemporary/ballet pre-professional dance program at Mission Dance Centre & Company.